Under the surface though you question where this is all leading. In Spacechem you were fed fish sticks, in Infinifactory you’re given red and yellow food pellets, dispensed by a machine. Input and output. If you were truly making the world a more efficient (i.e. better) place why are you eating dog food? 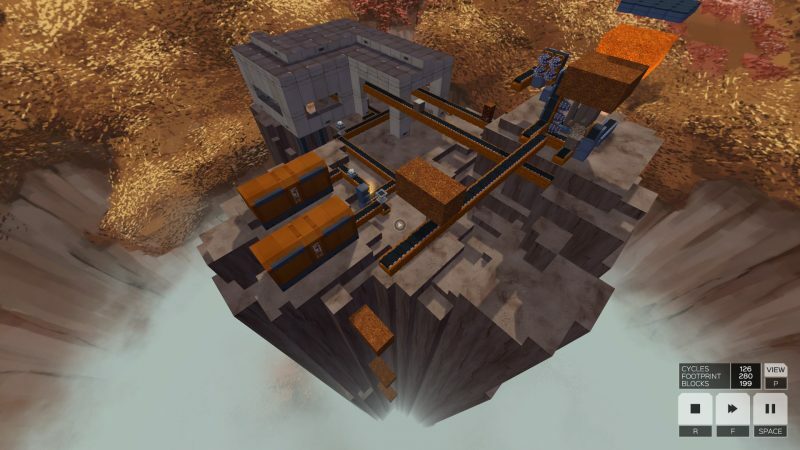 More than Spacechem, Infinifactory tells a story by the output you’re producing. Weapons of war feature early on – as does what looks like a disco dance floor but I wouldn’t put too much in that. Factory farming makes a somewhat disturbing appearance when you’re tasked with fencing in little critters and converting them straight into tv dinners. However, as a good alien abductee I had internalized the efficiency creed and was mostly concerned with the preventing the squirellikes from jumping off the production line. No, it was probably more the next scenario that got my gall. You’re making a lotion of some kind out of trees. It has to be ‘squeezed’ out of the wood and into cannisters and then lidded. Here’s the catch: In standard scenarios all component parts are created in the proper ratios. So if the output is made of 1 part X, 1 part Y, and 2 parts Z, the inputs of X, Y and Z come out in the ratio of 1:1:2. The lotion scenario produces bottles, lids and trees in equal measure. But you only need say a fourth of the tree to produce one ‘output’. Which means that the rest is discarded. You can save it up but there’s no point: You’ll keep receiving new trees for each new bottle and lid. So the efficient thing to do is to dump it as quickly and unceremoniously as possible. And hey, whaddayaknow, there’s and empty bottomless void right over there! Some of the same thing goes for whale meat processing. You only have some many processing machines so I was forced to junk half the whale because my machines couldn’t keep up [note: I only later realized that I could turn down the input rate. Either way the point stands for the blubber-to-meat ratio, I think]. The only overt political point the game makes is that an alien race (which itself lacks engineering skills) that abducts people to work for them as engineers is morally in the wrong. They’re also portrayed as stupid and pompous. It’s all probably a gibe at the video games industry, executives, crunch or something like that but it’s mostly neither funny nor interesting. What is interesting is whether you can make a point about our current system of consumption and production in a game that on the face of it delights in endless production cycles. Infinifactory doesn’t concern itself with byproducts of your endeavours. The energy use or the environmental costs. The unending and supposedly irresponsible consumption of your output. It tells you that the people you’re doing this for (in the first campaign) are evil and stupid. When you progress to the ‘liberation’ campaign and work for the brave resistance, nothing much changes though. You’re even still killed with the same warning signs if you wander off the plantation. I cannot tell if this is an oversight, a development shortcut or some clever point about all sides being the same regardless of rhetoric. The thing that Infinifactory does show you, is waste. Junking perfectly fine inputs just because of stupid systems design is waste. The thing is, waste is morally reprehensible to the capitalist as much as to environmentalist. Infinifactory walks a somewhat fine line here. You’re not tasked with making a profit so the game doesn’t punish you for throwing trees in a bottomless landfill. You are judged on the efficiency of your design but only relative to other players who labour under the same restrictions as you. Bottom line: No game mechanics work to tell the player that what they’re doing is bad in any way or indicate why it might be. Zachlikes have a unique opportunity to confront us with our system of production and consumption because no other type of game makes us so inhabit the mindset and motivation of the producer. If the developer chose to pursue it, we could get a front seat to see the environmental and social effects of our production line. While Infinifactory does hint that we’re making bad things for the baddies, the production is exonerated as soon as we start producing the same things for the goodies. What I would like to see is a way for environmental costs to meaningfully enter into the mechanics of the game. I am sure there are a ton of ways this could be done, the simplest of which would just be to add a counter of space whales needless slaughtered alsongside the time and blocks counters. This is what you did. You monster. Instead I’m left with this feeling of disgust at waste. I guess it’s up to me as a player to decide whether it is environmental outrage or an engineer’s revulsion at inefficiency.